We cross the city centre of Verona and then we head to the Ciclovia delle Risorgive (Water springs bike path), until Villafranca. There, always straight on to Mantua, cycling on small roads and river towpaths: the city will conquer our heart. After crossing its city centre, we cycle on the river Mincio cycle path and finally we reach Peschiera del Garda: lake Garda is right in front of us. We head north following the eastern coast until Torbole and there we cycle again on a beautiful bike path, the one that follows the river Sarca: great views over the lake Cavedine and the mountains. We cycle up to Nago, from where we can enjoy a great view over Lake Garda, then all the way down to Mori. Here we meet with the river Adige and its bike path, that we follow until Volargne. After Volargne, we cross Valpolicella and its nice vineyards and before getting back to Villa Guerrini in Montorio we cycle up to the Torricelle hills. Distance 300 km, altitude + 1.400, easy peasy. Here you are the list of the homologated cyclists of the Rivers and Lakes randonnée. See you soon, at the 400 km randonnée on 13rd and 14th April 2019. WHEN: Saturday 23rd and Sunday 24th March 2019. WHAT TO DO: Saturday, 23rd March 2019, yellow cards are given at the organisation tables from 17:00 h.
The itinerary is not signalised on the way: total self-sufficiency is expected. 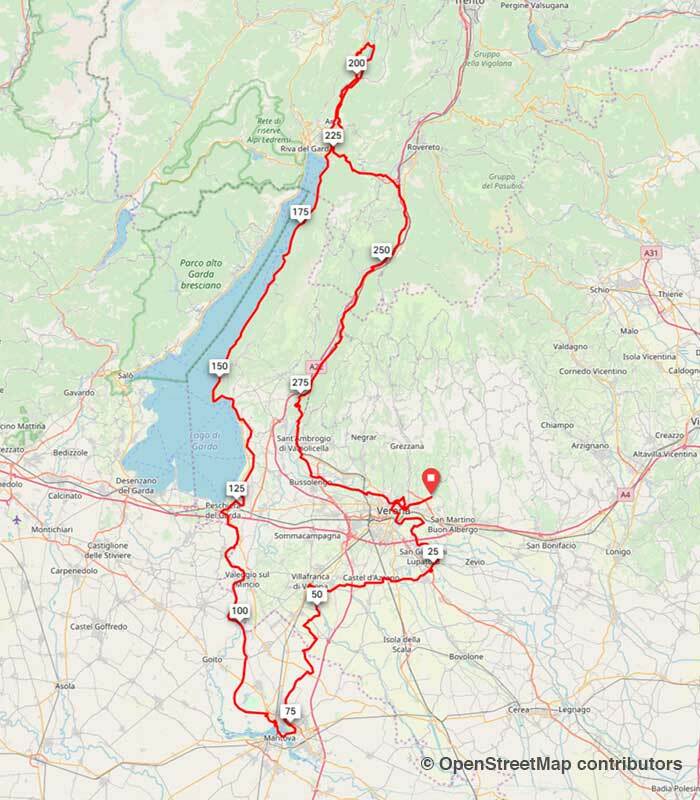 Gpx files and road book (to be printed on one’s own) will be available for download 15 days before the event. Average speed: maximum 30 km/h, minimum 15 km/h. Mantova (MN) - 80 km - Caffè Bibiena da Laura (refreshments): Via Accademia, 54. Loppio (TN) - 230 km - Bicigrill Duchi’s da Silvio (refreshments): Via del Garda, 5. CAR PARKING: it is possible to park some cars in Villa Guerrina parking, motorhomes are not allowed. Cars that won’t find place in Villa Guerrina parking, can park along the perimeter walls of the Villa or in one of the many free spots in Montorio. The organisation will communicate at entrance of the Villa if the car parking is full. Motorhomes (campers) are not allowed in Villa Guerrina parking: a good spot where to park is by the end of Via Guerrina, there is a lot of space and a green area. 3. Villa Cainer (scout house) in Mizzole, about 4 km far from the starting point. Sleeping bag and mat are needed, the cost is 10 € per person with minimum 10 bookings. In Montorio there are other B&Bs. Book autonomously the accommodations 1 and 2, specifying that you will participate at the randonnée that starts early in the morning: both the accommodation can prepare an early breakfast. Write here if you are interested in sleeping in Villa Cainer, we will manage it. Gpx tracks and road book are available on request.